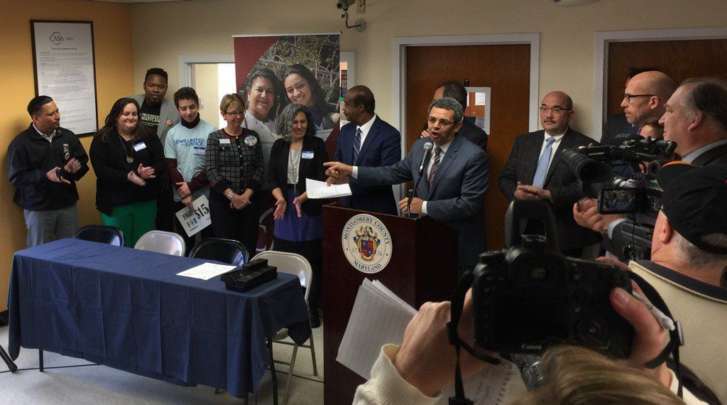 The mood was joyous as lawmakers, advocates and impacted workers gathered for the bill signing making a $15 minimum wage the law in Montgomery County. ROCKVILLE, Md. — The mood was joyous as lawmakers, advocates and impacted workers gathered Monday for the bill signing making a $15 minimum wage the law in Montgomery County, Maryland. The Fight For 15 effort next will target state leaders to try raise the minimum wage throughout Maryland. “It’s a good victory for all workers in Montgomery County. Annapolis is next,” 32BJ SEIU Vice President Jaime Contreras said. 32BJ SEIU is the largest property service workers union in the country with 18,000 members in the D.C. area. Nothing the delay until roll out, Contreras said it will eventually help people living in an expensive county. The new rules don’t apply to employees younger than 20 years old. But, the legislation includes an “opportunity wage” for workers younger than 20 who will earn at least 85 percent of the county minimum wage for their first six months of employment. Montgomery County joins an even more aggressive move in D.C. to help low-wage workers in the area. In the District, the current minimum wage of $12.50 will rise incrementally to reach $15 by July of 2020.